"At first, the hollering seemed like part of his dream." A light-hearted tale of a boy who gains self-confidence with the help of some timely mentoring. Albert is short -- very short -- and he hates it. His older brothers are tall like his father, but he takes after his petite mother. He wears too-large hand-me-down clothes from his bigger brothers. And worst of all, his very best friend moved away to Brooklyn during the school break. It was all so unfair. Albert is beginning Middle School on Little Scrub, the small Caribbean Island where he lives. As he steps on the bus, and sees the older kids, he feels smaller than ever. They take one look at him and howl with laughter, chanting "Little Man, Little Man, you so small, didn't hardly see you at all." Things go downhill from there, and would've stayed down if it wasn't for an encounter with Peachy, the leader of a troupe of stiltwalkers. The stiltwalkers do a lot more than walk: they dance and leap across the sand on spindly eight-foot high wooden stilts, their brilliantly colored costumes shimmering in the moonlight. Peachy invites Albert to join the high school students he teaches to stiltwalk. It's not an easy decision for Albert. Would they laugh at him even harder than the Middle School kids? And he is queasy about heights. The thought of wobbling around on those skinny wooden sticks makes him woozy with fear. But Albert is won over by the thought that one day he might actually be up there, tall as a palm tree, dancing around without fear or hesitation. Besides, desperate times call for desperate measures and nobody was more desperate than Albert. Slowly, as his stiltwalking improves, Albert finds his self-confidence grows. He becomes less of a target for teasing at school and he makes some new friends. We were lucky enough to briefly meet this author during the Blogger Conference this year in New York this past May. She seemed really enthusiastic about her new book, and I can understand why: this is her first real "baby." All of Mann's (don't you love her aptonym for this book?!) other works were non-fiction titles about various landmarks of history. This is her first novel, and how much she cares about her characters - particularly Albert - really shines through. It was such a great pre-teen book, though. I can't wait until my nephew is old enough to pass it along to him; I intend to hold onto it until then. I think it was great in the way it could appeal to young boys: there wasn't a ton of romance in it (although there was a sidebar crush), and it was a wonderful story about family, friendship, and learning how to make the best of what you've been given. 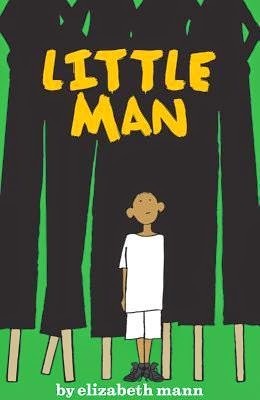 Little Man, better known as Albert, is a young Caribbean boy whose friend recently moved to New York (his father went there to teach Caribbean Studies in the United States). So he's lost his best friend at the same time that he is about to start middle school, and is unusually short for his grade (he's also skipped a grade, which is always difficult at that age and that point of development). He feels puny and insignificant compared to his peers around him, and that translates into unhappiness as he begins (what I believe is the equivalent of) the seventh grade. However, he soon meets this great group of high schoolers who perform as stiltwalkers, which helps Albert to both feel like part of a community and also earn some "stature" (in more ways than one), which he feels is vital to someone who feels as short as he always does. I loved this book because of the wonderful characters that Mann creates, as well as the vivid storytelling that goes along with them. Albert's family is made up of a solid father character, a caring mother, and two older brothers who love him despite their teasing. The stiltwalkers (known as Moko Jumbies) according to the book, are a tradition that stretches back centuries, through Trinidad and originally Africa. So the tradition combined with the modern take in the book blend well together. I especially like seeing everything through the eyes of a young boy who sees it all as very exciting and feels all the potential of learning something new. This didn't feel contrived or as if it were trying too hard; it felt like a real, believable story of a young boy trying to figure out his place in the world. While it's not a book I would have normally sought out, I enjoyed the storytelling and the setting, and I would certainly recommend it, especially to a young boy struggling to define himself.